Welcome to the registration page for the Greenville, S.C. Sheepdog Seminar. If you register on this page, we will donate back 15% to the Men's Ministry of Covenant united Methodist Church Greer, S.C. THIS SEMINAR STARTS FRIDAY AFTERNOON, FEBRUARY 23 - AT 1:00 P.M.
OTHER SPEAKERS AT THE SEMINAR include Texas Police Officer Gregory Stevens (left photo) and Retired Charleston, South Carolina Police Chief Greg Mullen. In May of 2015, Officer Stevens stopped two terrorists from committing mass murder. For his heroics, he was awarded the Medal of Valor for "preventing a deadly act of terrorism." Watch the video of Officer Stevens receiving the Medal of Valor. Chief Mullen served as chief during the tragedy at Mother Emmanuel in Charleston when 9 precious lives were taken in June of 2015. Pastor - you will want to hear his message to the churches. Pastors, church leaders, police officers; Chief Mullen will challenge us to engage our communities, initiate relationships - and much more. After hearing Chief Mullen speak of the principles he and his department had implemented, you will understand why the people of Charleston displayed such unity after the tragedy of Mother Emanuel Church lost 9 precious lives in June of 2015. Saturday, 8:00 a.m. - 3:00 p.m.
We do NOT offer refunds. If you cannot attend, you may sell your ticket(s) or transfer them to someone else. Thank you. The Hampton Inn is going to provide a special rate for Sheepdog Seminar attendees for $119.00 a night. This rate is available February 22, 23, and the 24. You can register online by clicking here. Or you may call 864-263-5555. 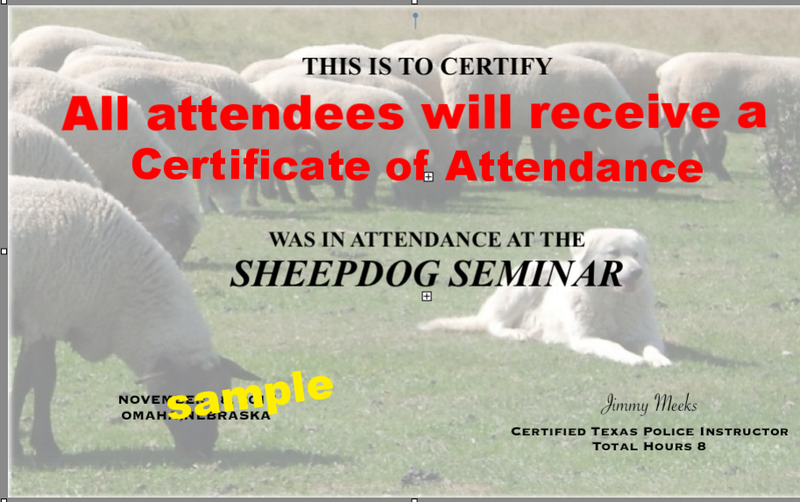 You must use the code word "Sheepdog Seminars." SOUTH CAROLINA POLICE OFFICERS WILL RECEIVE CREDIT.